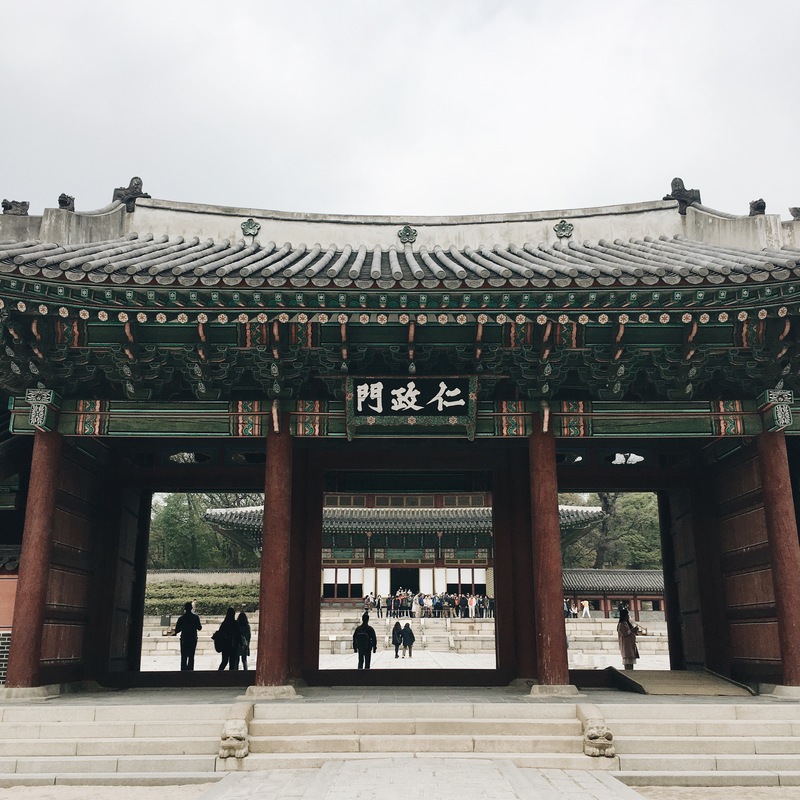 My trip to South Korea was a personal treat of sorts. I wanted to celebrate turning a year older in a foreign land for the first time, I wanted to mark the end of my temporary stint and the start of something new (I will share my post-graduation struggles in a later post), and I badly wanted to break out of the daily stasis, to see His lands, find my drive, my smile, my inspiration again. Prior to this trip, I haven’t a semblance of an interest in anything Korean. Okay that’s a lie. 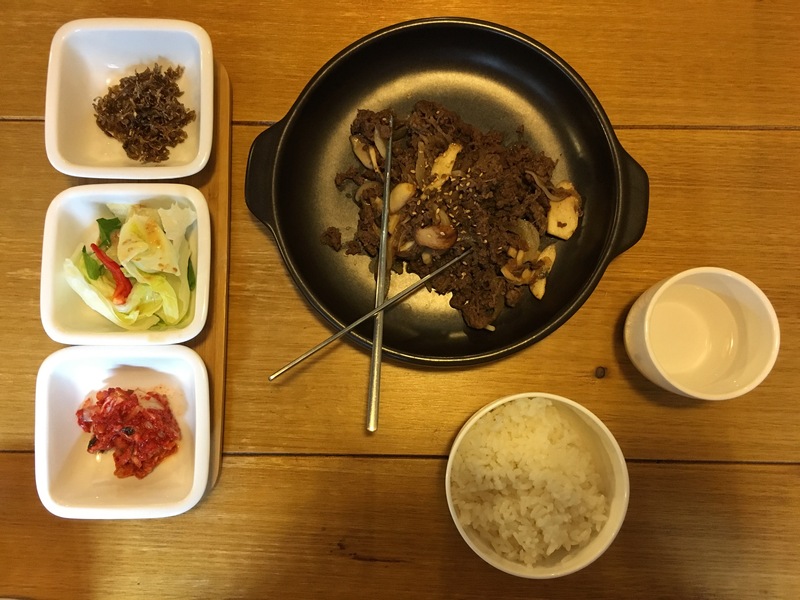 I am quite a fan of bulgogi, bibimbap and the likes. 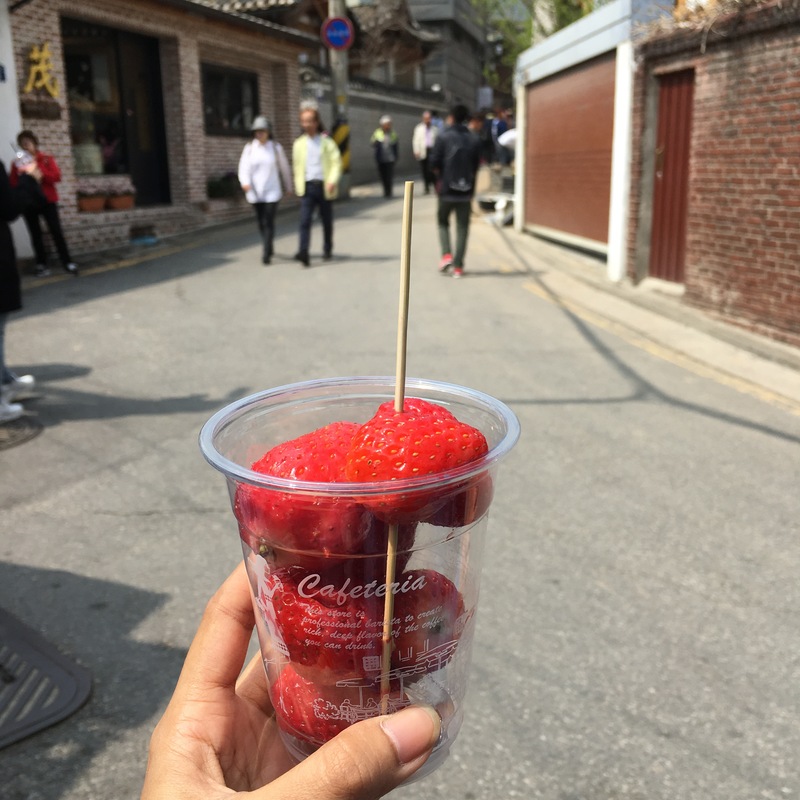 But aside from its gastronomy, a smatter of Korean I picked up from random k-dramas I got pulled into watching thanks to peer pressure, and a culture I scarcely know, I journeyed to this country with low expectations, and prayed that He would present me pleasant surprises along the way. 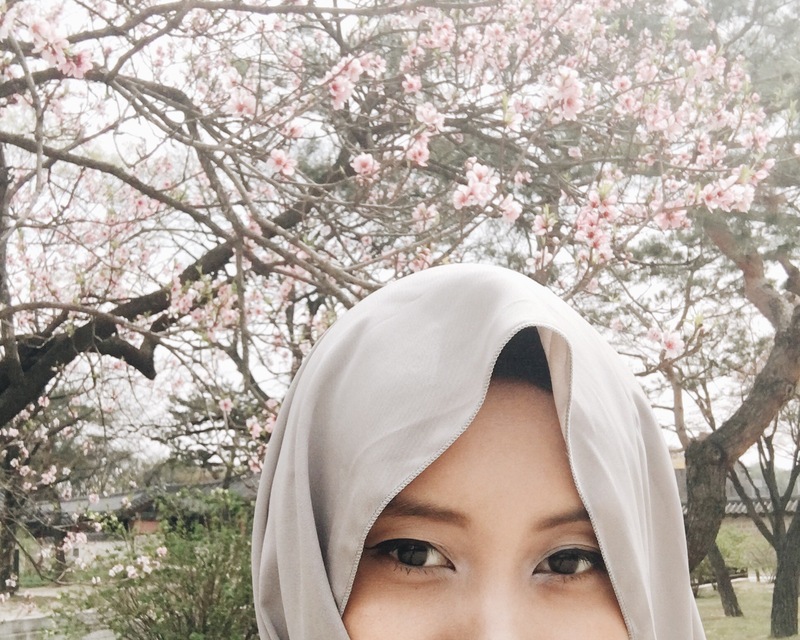 I have always wanted to experience cherry blossoms in spring anyway, and it further sealed the deal when I was told that South Korea is one of the safest Asian countries for female solo travelers, super convenient to get around and well-connected too. 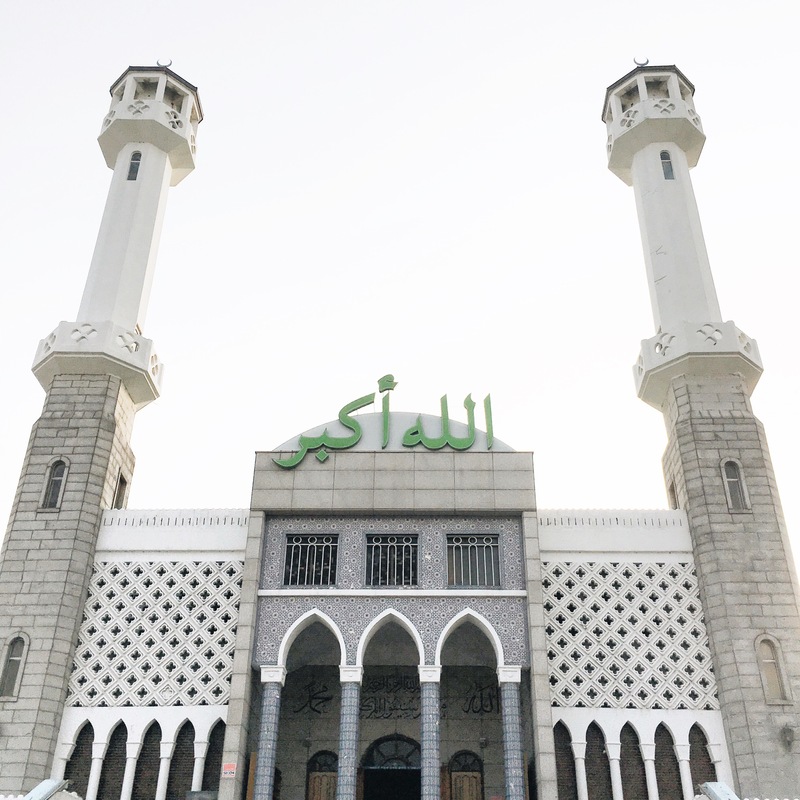 It also helps a mighty lot that the good people from Have Halal Will Travel have curated an app for Muslim travelers and I guess it’s fated when the first country on its list is Seoul! Itinerary planning can get pretty arduous for a sloth like I, you know. 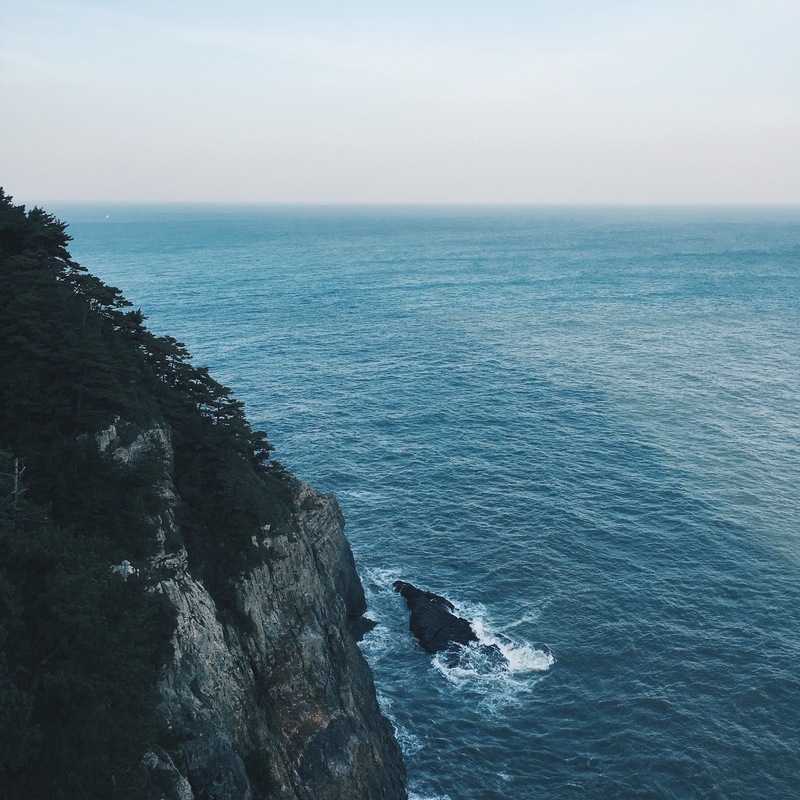 So I visited Seoul and Busan; the former because it’s the capital, obviously, and the latter for its scenery. 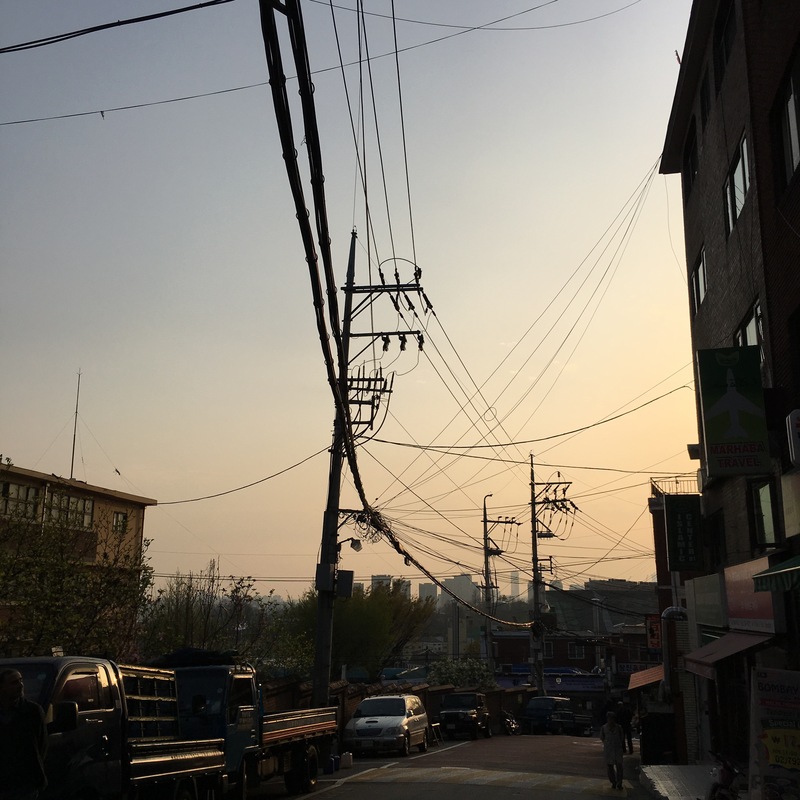 My first impression of South Korea, is that it’s a work in progress. Her streets adorned with cable lines, modern buildings surrounding traditional houses and palaces, uneven roads leading to shops comfortably tucked in obscure addresses, lone high-rise buildings against a mountainous backdrop and standing amidst a burgeoning landscape… I’d imagine, if Seoul was a person, she’d be this humble, hardworking, promising candidate during a job interview. Or something. Itaewon at 1700 hrs. My first glance of Seoul. Cafes punctuating every corner of her streets. Here is where the halal Korean food are mainly located, and this was where I conveniently chose to stay. 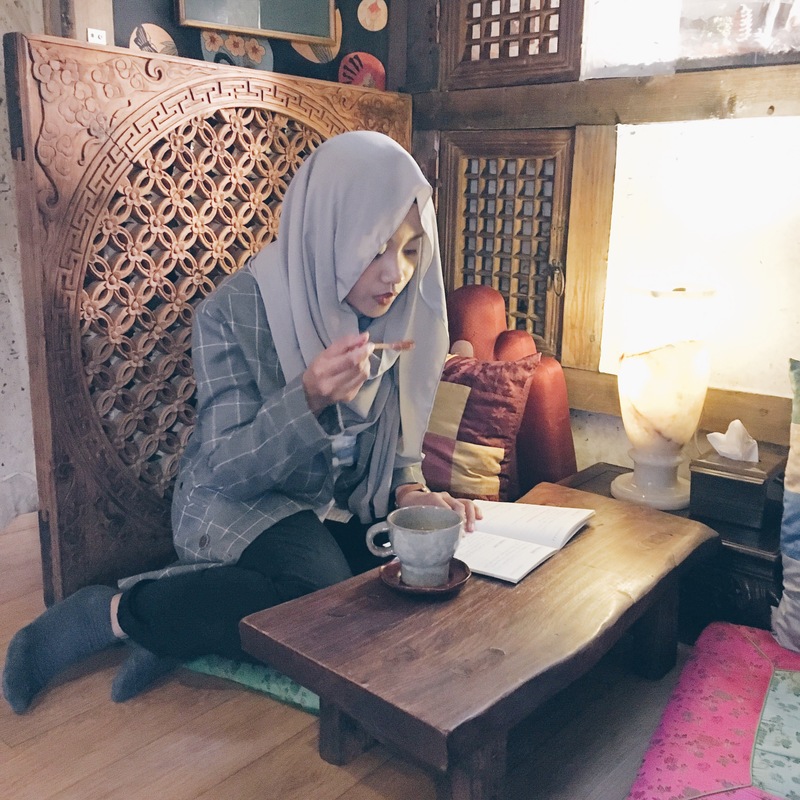 Sipping tea at an old Korean tea house, checked. Stand under a cherry blossom tree, checked. 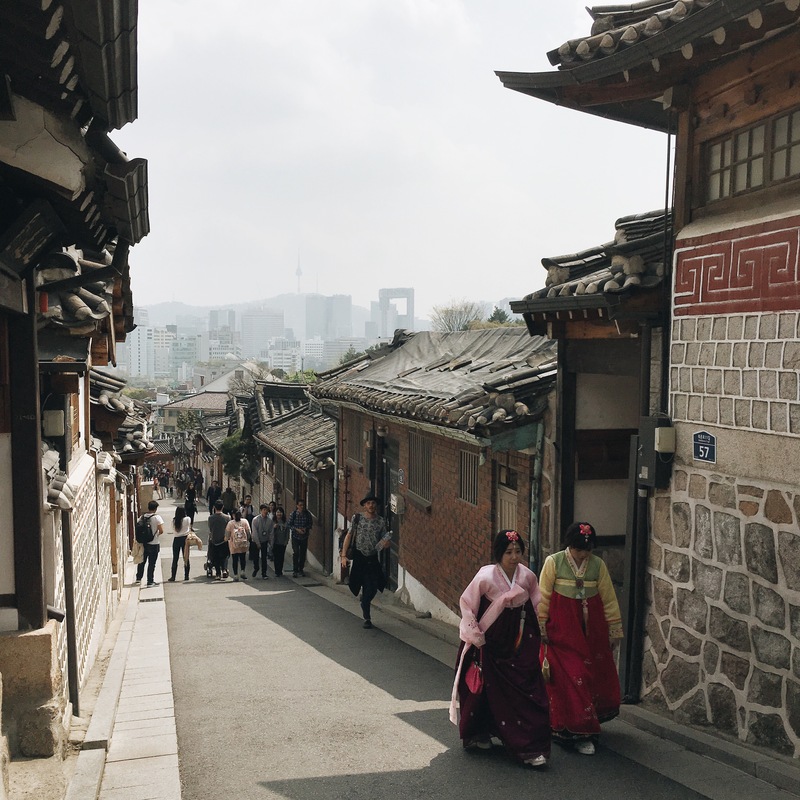 The view as I stood atop one of the intersections in Bukchon Hanok Village had me appreciating the quaint juxtaposition of old and new. I could barely make out the outline of the developing cityscape in the foggy, dreamy background, where the Seoul Tower loomed like a dignitary. There were plenty of touristy destinations I visited, and plenty more I skipped. 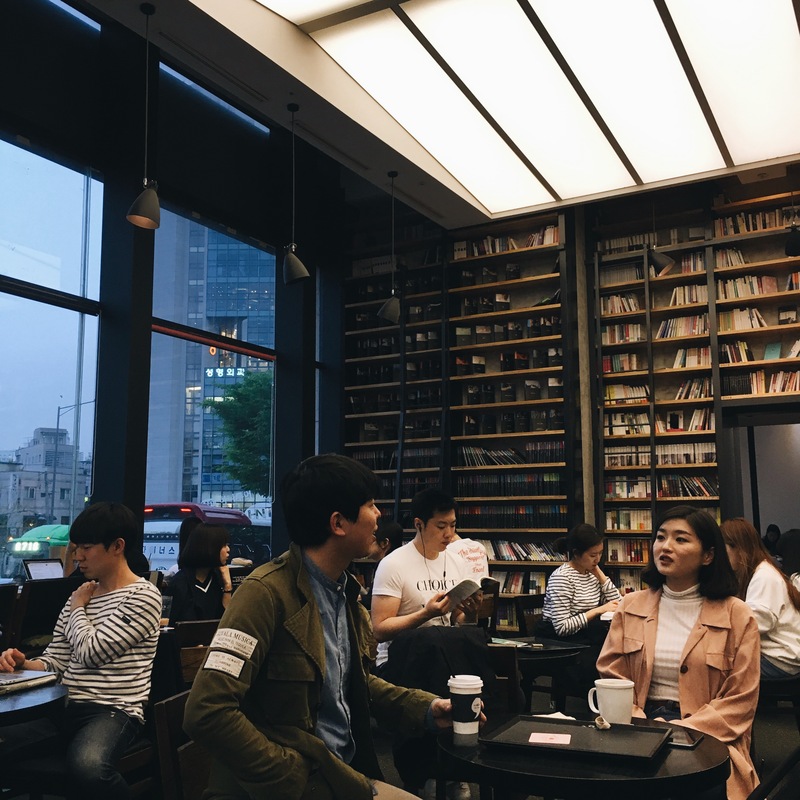 After hours of walking, shopping, eating, and sightseeing, all I really wanted was to retreat to a beautiful cafe which housed floor-to-ceiling shelves of books, books, & more books. 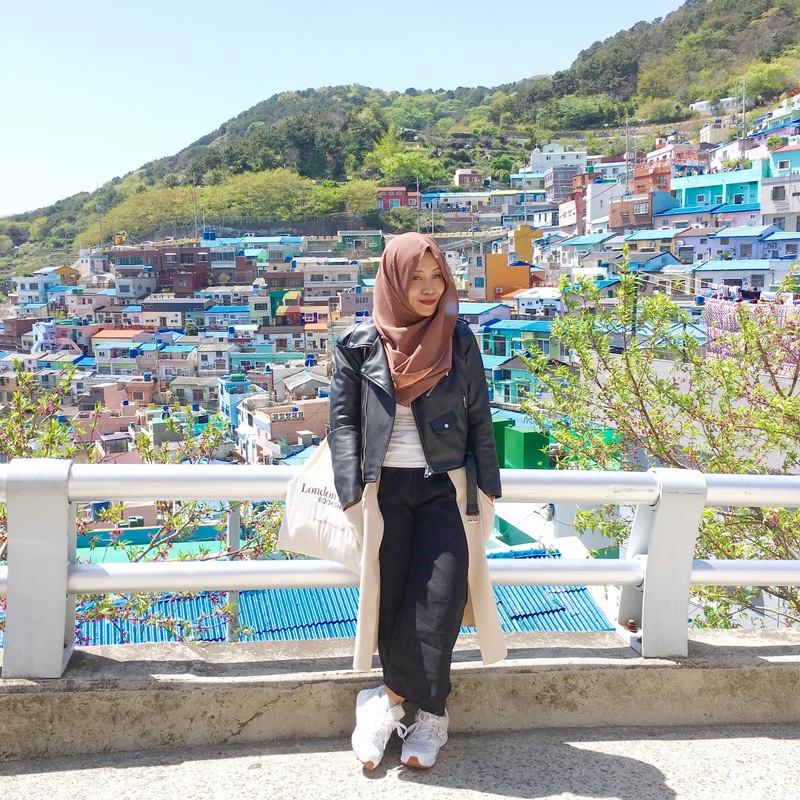 Since I was already in Seoul, I took the opportunity to visit her laidback and relatively less popular sister, Busan. 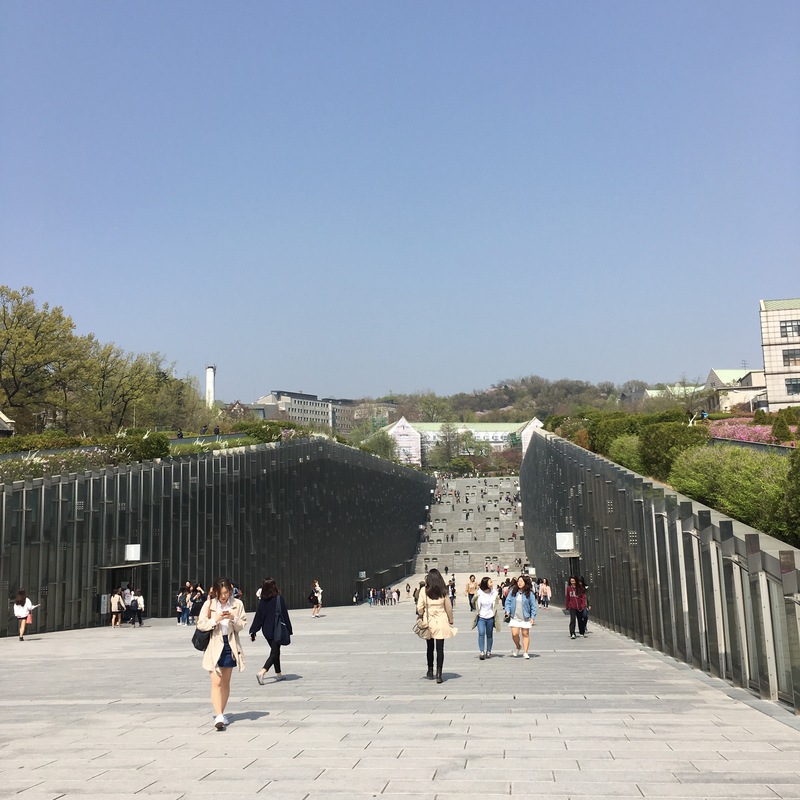 There was one place I really wanted to visit – The Santorini of the East, aka Gamcheon Cultural Village, aka #busantorini. There’s a quiet charm about this city by the sea. I have learnt, or more accurately, took this experience as a reminder to myself, to not judge a book by its cover (or should I say… jacket?) To put it simply, I’ve learnt to never judge a people and their culture based on ignorance. Because I was extremely uninterested about anything to do with the korean culture, I grew ignorant and unappreciative of the people and language that so many seem to find appealing. I wasn’t cognizant of the trends and even once thought there weren’t any differences between the Koreans, Japanese & Chinese. I used to judge my friends who listen to k-pop and watch k-dramas hahaha because I just couldn’t wrap my head around the hype (I’m slowly embracing this now and am no longer embarrassed to hide the fact that I do listen to some Korean songs & watch some of their shows that seem to grow on me, much to my annoyance lol). And so, because of this gradual acceptance of a culture so different from ours, I began to look at things from a different perspective, and embraced the differences that exist. So I began to read up more on their history and educated myself with a bit of their language. Ignorance isn’t always bliss. I guess I have come to learn, appreciate and love each other’s difference. 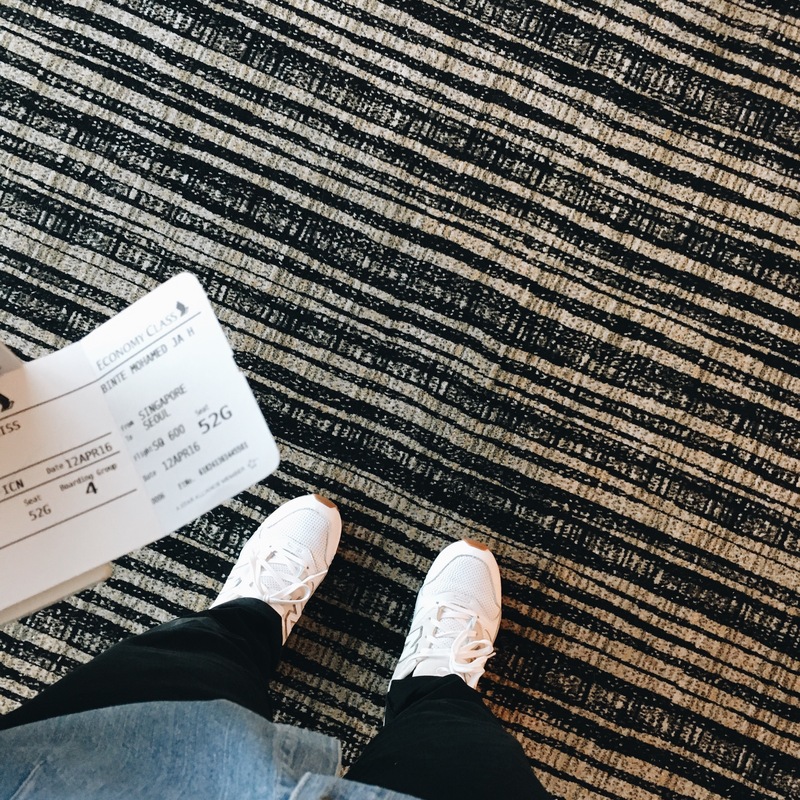 What made it easier for me to open up and appreciate the culture is the politeness and warmth I received from its people, as well as the language that’s laden with respect. As a student of language, it’s become second nature for me to listen and observe the way people speak, the inflections, the extralinguistic aspects (okay let’s not go there) and everything that comes with it. 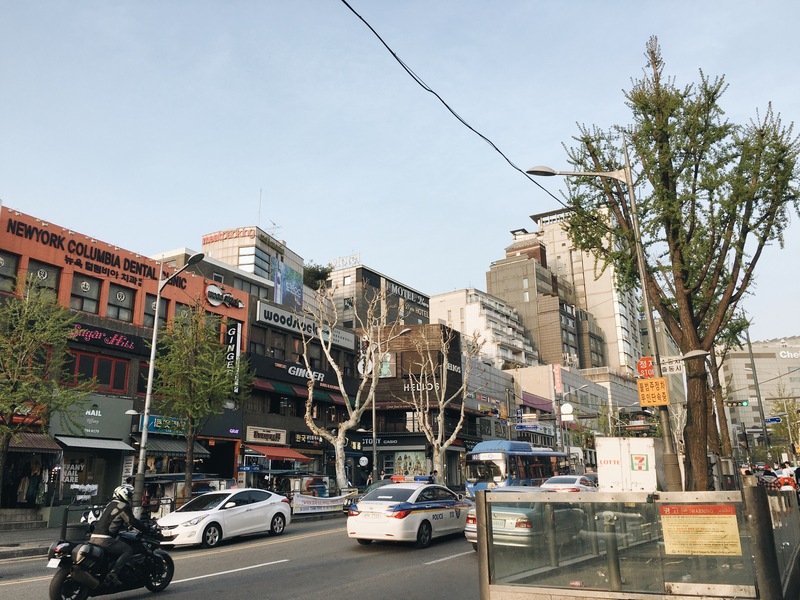 What struck me most was the kindness of the people, notably the ahjummas and ahjussis on the subways, which was a pleasant surprise seeing that the kind of treatment I usually got from my nation’s counterparts was one that’s pretty, well, brusque. These kind Korean elderly would offer, no they’d insist on me having their seats (like hold up isn’t it supposed to be the opposite?! ), and they’d flash a generous smile too while at it. 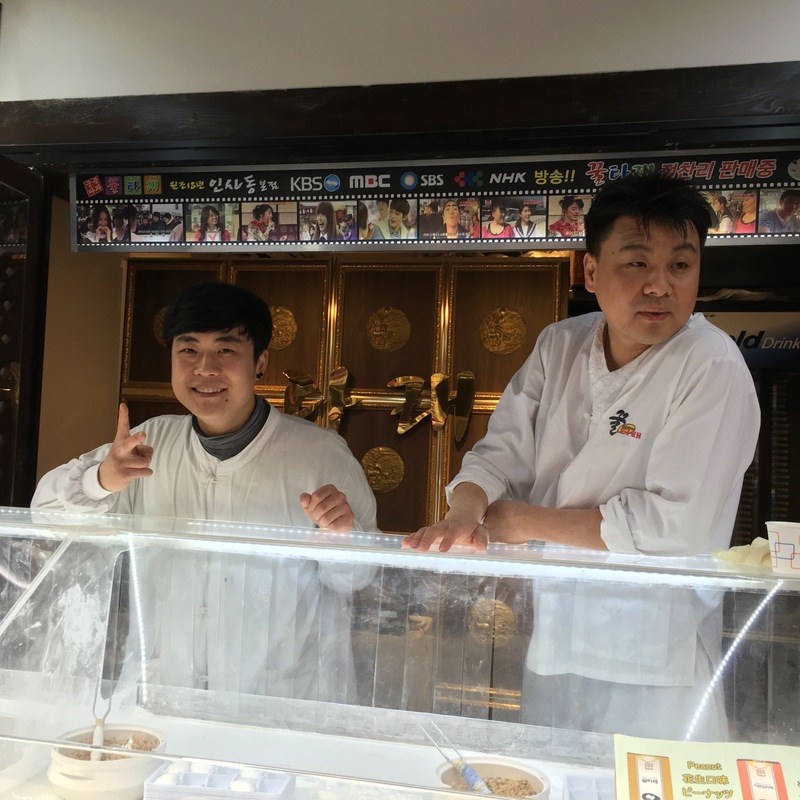 The adorable owners of the guesthouse I stayed at in Seoul served us omilja tea upon arriving and chatted with us til late, albeit the lack of a common language. I don’t know how we maintained a conversation that long, but well, I suppose kindness is a universal lingua franca. I’m grateful that He had brought these kind souls my way. Needless to say, it’s usually the people that’d make any traveling experience a more worthwhile one. This trip has also opened my eyes to the simple fact that, really, we can’t assume others to know what we already know. Some of the locals I came across with had this to ask me: “You from Malaysia? Indonesia?” When I replied “No, Singapore,” I was mostly met with surprised looks. “Ah, Singapore? 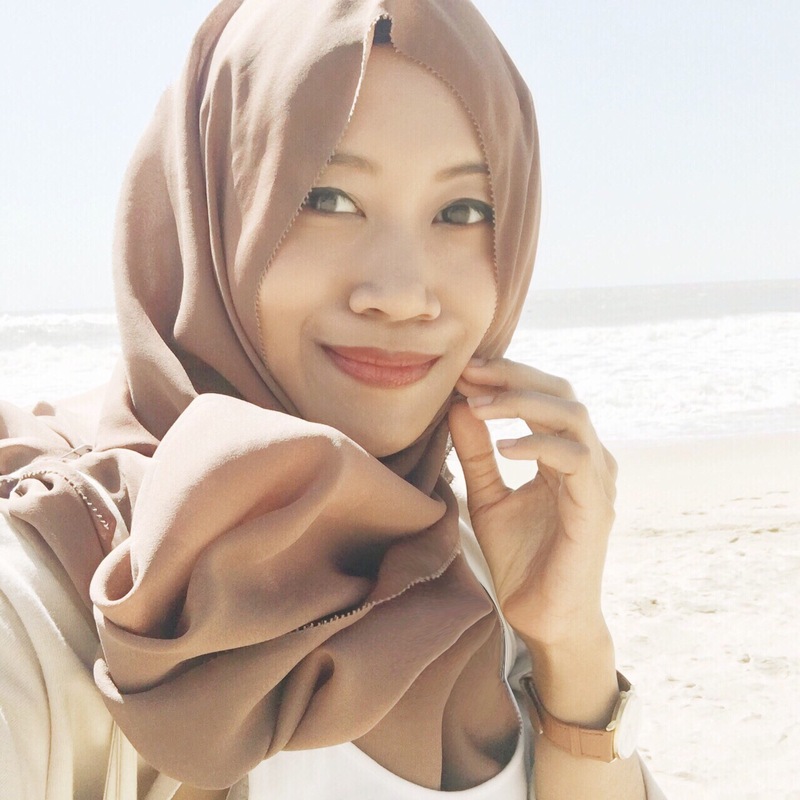 Hijab?” they’d gesture the piece of cloth we wear around our heads, genuinely puzzled that there are actually Muslims in Singapore. I proceeded to tell them that yes, there are Muslims in my country too. Initially, I was slightly annoyed, but my better self reasoned that perhaps they honestly didn’t know that Malays don’t only come from Malaysia and Indonesia. Perhaps all this while, they have only ever come across Malays from our neighbouring countries, or it could be that the Singaporeans they met were mainly Chinese. So I took it as an opportunity for me to educate, and realize that the role the hijab plays can be powerful, if only people were open enough to have a conversation about it. This incident reminded me that I am an ambassador of Islam, that I carry the flag of His good word, wherever I go. This country has also instilled my faith in the fact that originality always trumps… chiefly when it comes to food. I expressed my disappointment after tasting the fish and chips I had in London and told my friends “I’ve tasted better ones at Fish & Co”, and the one time I was in Spain to try their churros, had me thinking “Man, the ones from a cafe at Bukit Timah tasted much better.” Korea has proven that the original remains unrivaled. Seoul Garden Hotpot can’t even hold a candle to their glorious spread of authentic Korean food. Honestly haven’t had enough of the good grub even after having their beef bulgogi for days. Besides that, I’ve also become more aware of how every single one of us have an important role to play in recycling. Recycling seems to be taken seriously here – a practice I greatly admire. The hostel owners explained in detail on how we must be meticulous in our disposing of waste. I observed one of them filtering out the recycling bins, removing wrongly thrown waste, and making sure everything was in its place and recycle-ready. It was also pretty delightful to see recycling receptacles on the streets, at the subways, etc., basically just more visible than what I was used to seeing. It’s a responsibility I wished was practiced more rigorously back home. I do see the effort in campaigns to raise awareness towards sustainable living, but I think we certainly have the capability and resources to contribute more in our part to save the earth. Lastly, this city, I’ve discovered, is a terrible destination if you wish to disconnect and de-tech. 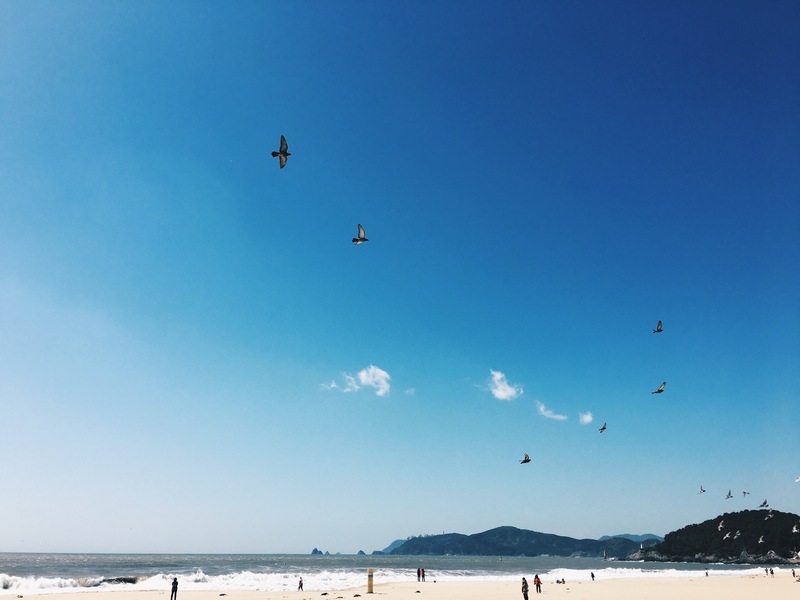 In a place where wi-fi is ubiquitous, on subways, the streets, and even at the beach… getting lost is not exactly an easy thing to do. You will get connected at most places, even if you don’t wish to. I was amazed to find that the connection of the Whatsapp call function worked so much better here for overseas calls than when I called my friend locally in Singapore! Their technology is something else. Ultimately, I have learnt that no matter the barriers in language, differences in culture, practices, lifestyle, tradition, taste… what connects us all, the essence of what makes us human, still remains. We are all the same. We speak the language of kindness, we thrive on goodness and warmth from strangers, we struggle, we cry, we celebrate, we smile, we are all living and creating good memories every day, the best we can. Learnt new things, had interesting encounters, and found seoulace in a city which was once a stranger, now turned newly acquainted friend whom I’m thankful to have met. Perhaps I’ll see you in another season. Time to get back to the grind, better and stronger, reflecting on all that’s passed, and all that will.